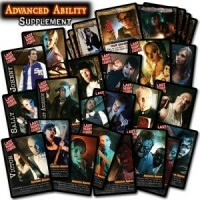 The Advanced Abilities Supplement is a Web-exclusive for Last Night on Earth and features eight new game cards for the Zombie and Hero Decks and 20 new Advanced Ability cards (16 Hero and 4 Zombie) as well as the new rules for using them. All pieces are printed on the same high-quality card stock as the boardgame. The cards are exclusive to this supplement and will not be available anywhere else. The new Advanced Abilities cards can be added to any existing Scenario as a way for both the Heroes and the Zombies to gain experience during games unlocking powerful new abilities. There is a unique Advanced Ability for each Hero character, allowing them to "level-up", as well as global abilities that the Zombies can get. Add a Review for "Last Night on Earth: Advanced Abilities Supplement"